The PLC Analog Application Learning System – ControlLogix (89-AS-AB5500) adds to the Programmable Controller Troubleshooting Workstation (890-PECB) and the PLC Troubleshooting Learning System-AB ControlLogix (890-AB5500) to teach PLC control of analog input and output devices. Analog I/O capability enables PLCs to more precisely control processes by providing variable output signals and receiving variable input feedback from sensors. Popular applications include temperature control, liquid level control, and variable speed conveyors. 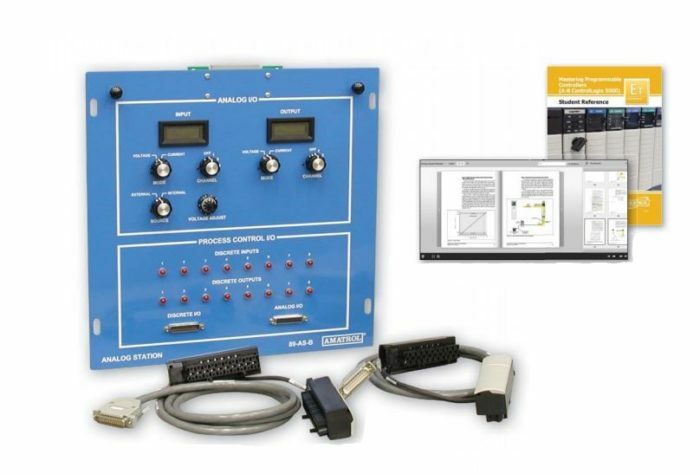 The analog training system includes an analog application station, cable assembly, Allen-Bradley ControlLogix combination analog module, student learning materials for both theory and lab, and a teacher’s assessment guide. Students will learn industry relevant skills including how to operate, interface, program and troubleshoot PLC systems using analog I/O. Amatrol’s analog training system includes an interchangeable analog application station that enables students to quickly set up the 890-PECB and 890-AB5500 systems for analog study with live components. As with other 890 application stations, the analog station attaches to the application console with quick release connectors. The station stores conveniently under the workstation when not in use. The analog training system adds to the 890-PECB and 890-AB5500 systems to provide a self-contained learning platform for study of analog control. The analog application station includes a 10-turn potentiometer with 0 – 10 VDC signal and digital readout to provide an analog input to the PLC analog module, while the analog output from the PLC is displayed on a second digital readout. Power for the station is supplied from the 890-PECB. The analog training system also provides a convenient, compatible interface to external analog devices, enabling students to extend their study of real world applications, such as process control. The analog application station supports connections of four analog inputs and two analog outputs. The station is compatible with both voltage and current signals with a selector switch setting. It also includes 16 discrete I/O connections and indicators to support control of processes that require a combination of discrete and analog I/O.